Sweaty and injured, we hobbled back to our apartment. We stopped at a corner store where Ang bought a bottle of cold water. The transaction took less than a minute but again made me realize the severity of my financial situation. I too wanted a bottle of cold water, and I couldn't get one for myself. I also couldn't bring myself to ask Ang to buy one for me. The thought of asking crossed my mind. The words died in the desert that was my mouth. If I did not get cash, I was liable to choke to death on pride before we made it to our second country. Being hot and feeling helpless is not comfortable place for me. Fortunately, our apartment was near a grocery store. And grocery stores accept credit cards. Unfortunately the one we visited was out of plain water. "Where is the cold water without flavor?" "Ah! That, I do not have." In Spanish, that conversation is adorable. Ang & I laughed out loud at both it, and at the fact that we were in a grocery store that didn't have any plain water - chilled or distilled. Still, it did have wine. And snacks. And the ability to accept my credit card. We were a "go" for relaxation. It was probably 6 PM. One of the best things about Argentina was the food. There seemed to be delicious, well known places every few blocks. I recommend the city to people who love food, and to people who (due to foot injuries) are incapable of walking very far. On our second night in Argentina, we ate at Don Julio. 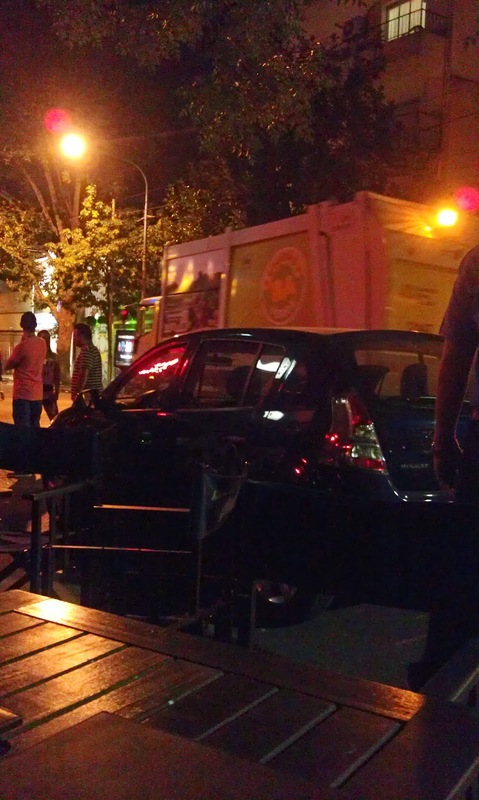 Yes, we happened to be just blocks from one of the top ten restaurants in Buenos Aires. I'm sure Ang planned it that way. Apparently, it only takes a day to get accustomed to the Argentine lifestyle, because we showed up for dinner at 10pm. There were more than a dozen people on the list ahead of us, meaning we weren't seated until 11. We had two rounds of the "while you wait bubbly" and took a lot of pictures of people waiting on a street corner. Our timing was so off, by the time John showed up to meet us (to go out), we were just getting our bread for the table. 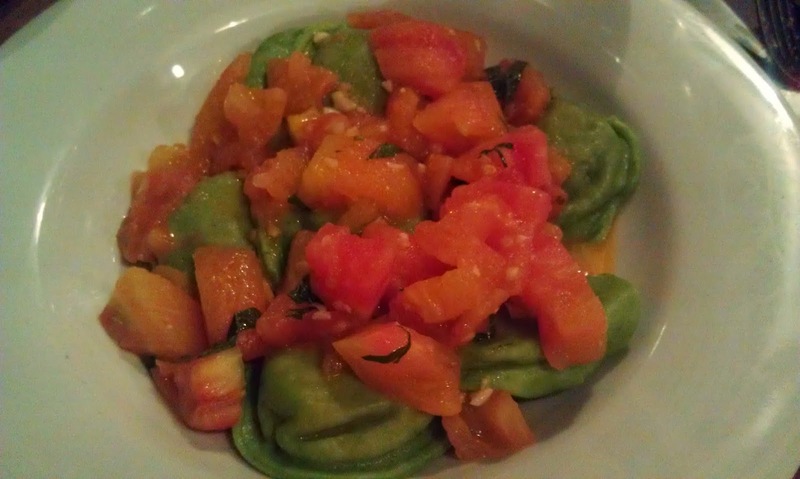 I had the spinach ravioli, filled with a pumpkin something. It was delicious. We also had empanadas and there was a sausage of some sort and wine. We finished dinner around 1am, and there were still people being served. John & I walked Ang back to the apartment, then went in search of adventure. I mean if people leave dinner at 1am on a Monday, they must be going somewhere afterward. John had ideas, and I was content to go along for the walk. It has to be noted that we were at the mercy of cached maps and spotty WiFi. Ang & I got to dinner by memorizing street names and counting blocks. After dinner, John and I headed in what we thought was the right direction toward a place about which he had heard from... I have no idea who. Eventually we realized we had no idea where we were, but we were also unable to orient ourselves. We pooled our collective experiences in the neighborhood and agreed on a direction. Two blocks later we caught a taxi, told him where we wanted to go, and laughed as he calmly made a u-turn. Our postprandial jaunt landed us right back where we started: Maleva RestoBar. We sat outside at 1:30 on a Monday morning and watched as life happened. It wasn't the adventure we originally sought, but for me it was perfect.